Ever wondered how to make your own boilies for your carp, barbel, catfish or even tench fishing? Well here's everything you need to know about making your own bait set out in easy-to-follow steps. Following these steps is not only easy, but believe us when we say that catching your first big fish using boilies that you have made yourself really takes some beating. Yes - you'll need a few extra items in order to make producing your own boilies easier and faster, but if you intend to create your own baits regularly, you will quickly make up the cash that you have laid out on the rolling table and other equipment. Not only will you quickly save cash, but you'll have the flexibility to create rock hard baits for those long sessions, or very soft baits for when bites are really easy to come by. You could create your own bait flavours, you could place cork balls within the rolled boilie mix to create pop-ups, and you could save some of the mix for paste - great for wrapping around your boilies to give them even more attraction. Making boilies however doesn't have to be a chore. It also opens up a whole new world of possibilities and all you have to do is follow our simple sequence below which will guide you through this very easy recipe. Mix all the powdered ingredients together really thoroughly in a large bait bucket. Crack four large eggs into a mixing bowl and add the liquid additives and food colouring. Slowly add dry powder to the eggs, never the reverse. Do this until a sticky paste is produced. Put the paste in a resealable bag and leave for five minutes until all the liquid is drawn into the bait. Pinch off a small nugget of bait and roll it between your palms until a round ball is produced. To produce wafter hookbaits I add a handful of cork dust to the dry ingredients before mixing. For pop-ups that stay buoyant indefinitely mould a small amount of paste around a cork ball. Boil the baits for around one minute to give them a tough outer skin. Lay the boilies out on a sheet of plain kitchen towel and allow them to dry for an hour or so before they go into the freezer. When preparing winter baits, use ethyl alcohol-based flavours. This is a highly water-soluble solution, ideal for adding an instant flavour hit around the bait. 10ml to 20ml of fish oil added to your bait not only adds extra attraction, but also makes the baits easier to roll. Make your baits bright with the addition of a powdered colour. Carp will first be drawn to a food source by its appearance, just like humans. Make critically-balanced baits by using approximately 60percent bottom base mix and 40percent pop-up mix. Add a palatant to your bait mixture. These bring out the best in your chosen base mix and flavour combination. 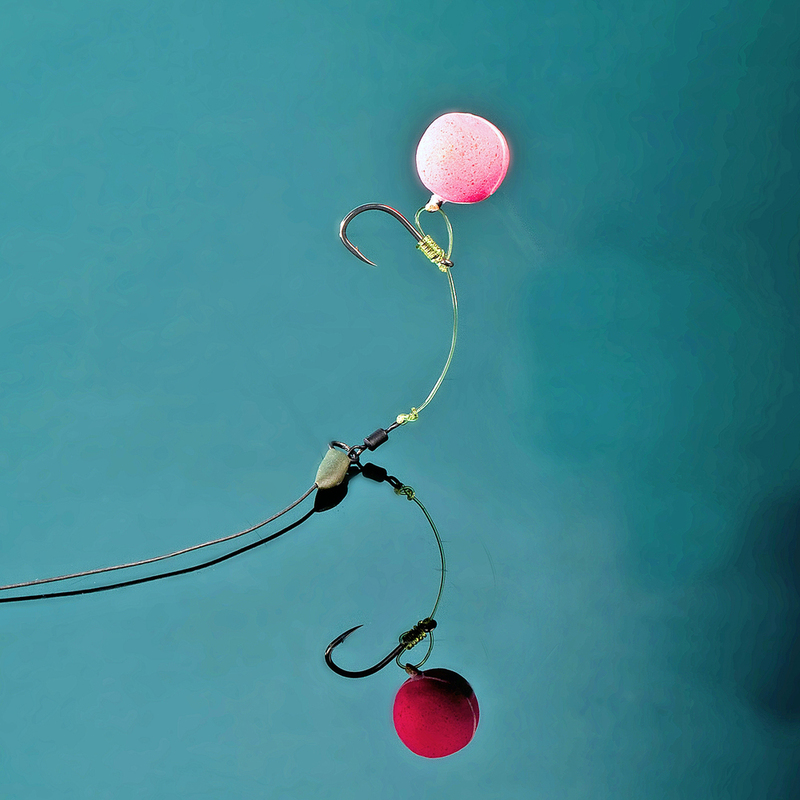 Use different shaped baits like squares, tubes or triangles, rather than standard round balls. Don’t just use tackle shop flavours. Experiment with things like curry or chilli powder, oyster sauce or even shrimp paste. Boilies are the number one bait for big carp fishing, big barbel fishing, catfish and even specimen bream or tench fishing. They are the perfect bait to use if you want to break your personal best weight for all these species. A boilie is a protein-rich, round bait that has been boiled to create a hard outer skin. They are available in different sizes, different colours and different flavours – way too many to mention here on this page. They are produced by adding eggs, colouring, flavouring and extra additives to a powdered base mix, then mixing thoroughly to create a paste, then shaping into balls, then boiling for between a few seconds and a couple of minutes to cook and harden the outer skin. Boilies can be bought in two types – shelf-life and frozen. Shelf-life boilies tend to be harder than frozen boilies (when they defrost) and contain preservatives to ensure they do not rot in the bag. Freezer baits don’t contain any preservatives – as the name suggests they are frozen to ensure the baits remain fresh before they are defrosted and used. What is a base mix? Base mixes can be a number of things, but in the main they form the largest ingredient in a boilie’s make-up. There are three main types of base mix:- milk protein, fishmeal and bird food. The milk protein base mixes are very much like baby milk compounds – full of added goodness and protein that go a long way to ensuring babies get the right level of nutrients. Fishmeal base mixes are just that – powdered fishmeal. Again, this is full of fatty acids and proteins designed to attract and feed fish. Finally, bird food base mixes contain tiny seeds and crushed seeds that again provide the fish with a healthy diet. So how are they made? The base mix is the start of the process. It will be a powder and, in the case of bird food base mixes, it will also have tiny seeds within the powder too. To this powder all the other powdered additives are added and mixed together thoroughly. 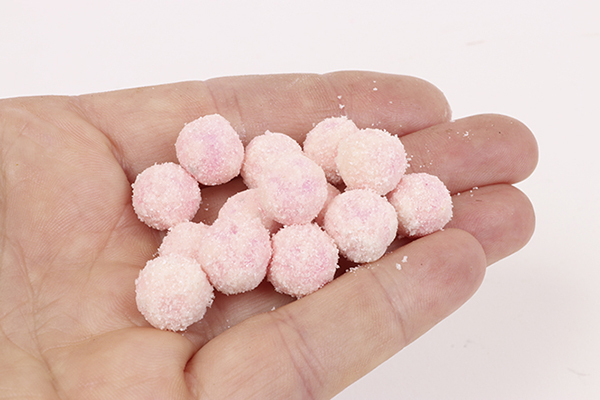 If a powdered colouring is to be used in the boilies, this is the time to add it and mix it into the powder. Next, the eggs are cracked and added to the powder. Most home-made boilie recipes require six eggs. Once the eggs are sitting in the powder, any liquid additives should be poured over the eggs. You can add any liquid colouring or flavours at this stage. Some specialist anglers like to add liquid additives too, such as Multimino, to give their boilies a little extra attraction. Now, the powder and liquid and eggs are whisked together thoroughly until all the ingredients resemble a paste. If the paste is too sticky, a little more base mix can be added and kneaded in until the paste is flexible but does not stick to the hands. Next the paste is rolled into sausage-shaped tubes, placed upon a rolling table and rolled into the correct sized balls. As soon as the balls are formed they are placed into a sieve and lowered into boiling water for between 30 seconds and 2 minutes, depending upon how hard the boilies needs to be. If you make your own boilies, always save a little of the paste. This can be used to great effect by moulding it around the hair-rigged boilies and fished as per normal. The softer paste will dissolve fairly quickly, and in doing so it will emit a long-lasting scent trail that will help attract more fish to your bait. But this spare boilies paste mix doesn’t have to be used wrapped around a boilies – try it around a large halibut pellet and you’ll also get great results. The vast majority of boilies sold are sinking baits, but there are buoyant, floating boilies available, called pop-up boilies. These can be used as an alternative to bread or dog biscuits and fished on the surface in the warmer months. But their best use is to create pop-up rigs on the bottom. The pop-up boilies is threaded onto the hair and counter-balanced by adding a large shot or some tungsten putty onto the hooklength. This little weight will anchor the pop-up boilies so that it sits just off the bottom. Doing this will add extra attraction to the bait because lifting it off the bottom by an inch or two will ensure that the fish sees it more readily. Pop-up boilies can be produced at home, using specialist pop-up boilies base mixes, but there’s no need to go to those lengths because most good fishing tackle shops sell pop-up boilies ready made and in a wide variety of colours and flavours. Because boilies are so high in proteins and goodies, they aren’t the ideal bait to loosefeed – they are expensive too! You are best loosefeeding particles, pellets or groundbait to form a attractive bed of scent, then place your boilies hookbait directly over the top. But, a single boilies sitting on top of a big expanse of pellets and particles or the likes can prove a little off-putting to the fish, so it makes good sense to introduce at least a few boilies. This will give the fish the confidence to take them. The best way to ensure that you feed a swim with a few boilies accurately is to use PVA tape. This product can be used to create stringers – strings of bait similar to a necklace. But the magical properties of PVA are such that it dissolves in the water, leaving a series of baits next to each other in a fairly tight pile. Simply thread two or three boilies onto a stringer needle or long baiting needle. Now pass a length of PVA tape around the hook of the needle and push the boilies off the needle and onto the PVA tape. Make sure the boilies are at least an inch apart upon the tape, take the tape and pass both ends over your hook point. Now, when the baited rig and stringer lands, the PVA will quickly start to dissolve to leave a small pile of boilies right next to your boilies hookbait. Perfect!